2,465. That’s the number of satellites that are whipping gracefully around the Earth as you read this. Of those, only 1,100 are actually active. The rest are either unresponsive or inactive—essentially, space junk. Here’s another number: 21,000. That’s the number of fragments—at least 4 inches wide—that are currently being tracked as they orbit the Earth, too. There are probably millions of smaller pieces, says the European Space Agency. These fragments are often the result of in-orbit collisions between satellites and space debris, sending thousands of pieces of what amounts to shrapnel into orbit. As life in Earth’s orbit gets more crowded, it also gets more dangerous. That’s why the ESA launched a project called the CleanSat Initiative, a program that’s looking for ideas to help “scuttle” satellites when their lives have ended—and, ultimately, write those ideas into law that would require companies to comply. But even that solution has its limits. Not all dead or dying satellites can be moved higher—for any number of reasons—and plenty are already defunct. Last week, we looked at SNAP-10A, the nuclear reactor satellite that the US launched into space in the 1960s, only to have its electrical systems fail less than two months into its mission. NASA predicts it will orbit for another 3,000 years. 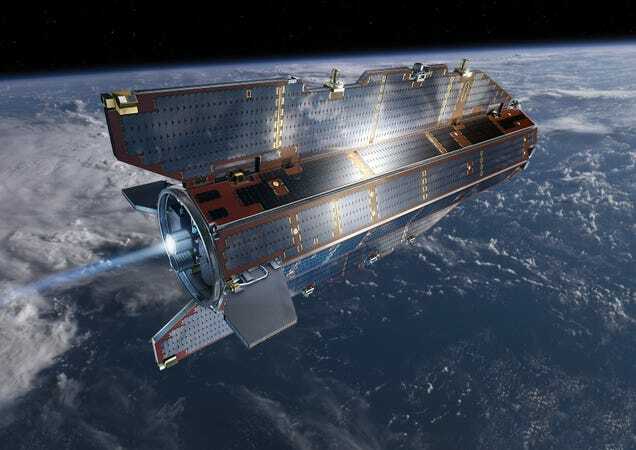 In short, the ESA wants to find a faster, more reliable way to push old satellites either down to Earth or up into the graveyard orbit. It’s now asking private companies to collaborate on ideas for such a plan, and will ultimately chose 25 concepts to focus on over the coming years. Though the ESA has yet to release its finalised brief, it’s clearly focusing on several key concepts. 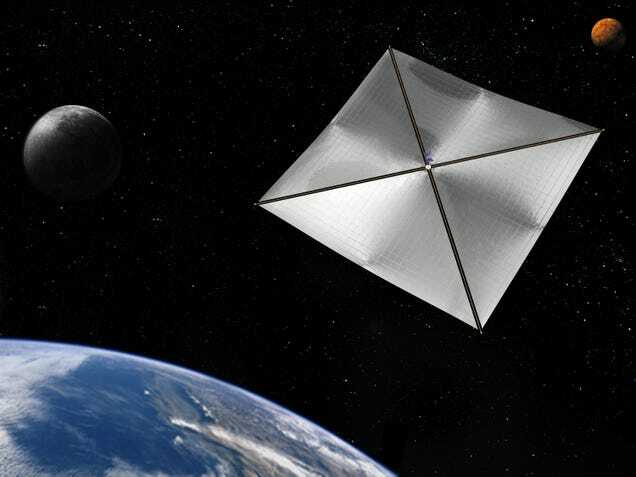 One is a solar sail—which uses the force of the sun’s radiation a bit like a boat’s sails use wind—that could actually pull old satellites down to Earth. 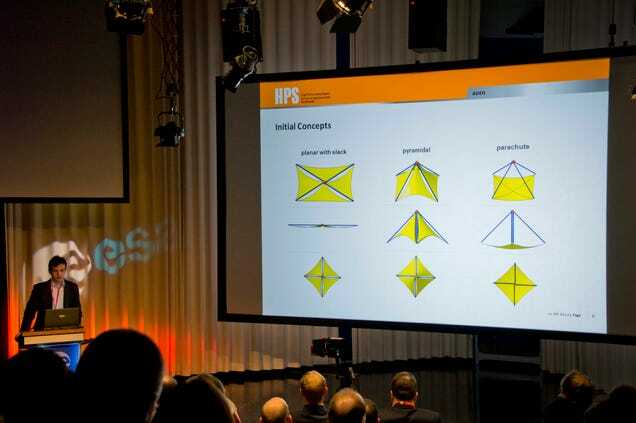 That was the concept presented by a German company called High Performance Space Structure Systems at the ESA’s CleanSat workshop in March. It is used to deposit the remains of spacecraft that do not burn up on re-entry into the Earth’s atmosphere, such as the carcass of the Russian Mir space station and waste-filled cargo ships. The remote location was specially selected for the disposal of spacecraft because of its depth of four km and distance from shipping lanes. If the ESA were to develop a solar sail that could push dead satellites down to Earth, it could also do so in a controlled way, depositing their remains over the cemetery rather than over a populated area. Research satellite GOCE re-entered the Earth’s atmosphere in 2013. Most of the debris burned up, but about a quarter of the satellite “slammed into the Atlantic ocean between Antarctica and South America.” ESA. Other government agencies around the world—including the ESA—have similar policies written into law. But that ignores a big chunk of the groups launching things into orbit these days: Private companies. A big part of what the ESA is trying to do with CleanSat isn’t just develop better ways to get rid of old satellites, it’s looking for better ways that private companies will actually adhere to. It’s “the problem of achieving compliance with mitigation regulations,” as the ESA said last week. NASA, too, says that “Many firms voluntarily adhere to measures” designed to limit debris. It’s an aspect of space law that’s coming to a head as more companies push into orbit. And it’s far from the only legal aspect of space travel that’s up for debate—whether or not the FAA can regulate space travel is another major legal rat’s nest that’s due to be untangled over the next few years as commercial space tourism gets off the ground. Likewise, the issue of mining rights, as well as development rights, on asteroids and even the Moon is another thorny issue up for debate. Space law sounds like a scifi job title, but it’s fast becoming a very real thing.